This was one of the first BT mugs I’ve posted at Starbucks-Mugs.com. The initial picture was blurry render from the Starbucks brochure intended for internal use. Today, thanks to a collector (see credits watermark), we can finally enjoy real life photos of this mug. Looks like it was available in stores for a fraction of time, before pulled from shelves as an error mug. 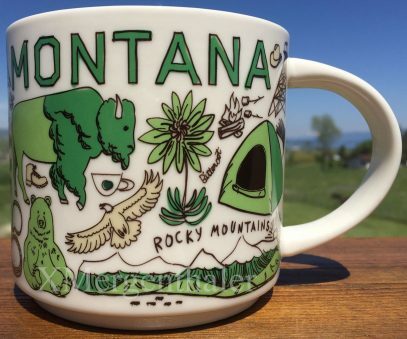 That’s right, this is actually Starbucks Been There Montana v1 and you can’t buy it in stores anymore. The misprint is on the front of the mug, where it says “Bitteroot”, while it should be Bitterroot – the name of a small perennial herb.